What are some important pilgrimage sites in Orthodoxy? In Catholicism, obviously Vatican City/Rome are big ones. There are also various basilicas in the USA that are pilgrimage sites, such as the National Shrine of the Immaculate Conception in DC, and cathedrals like St. Patrick's in NYC. Are there pilgrimage sites in the USA for Orthodoxy? What about elsewhere. The relics of St John of Shanghai in cathedral in SF. The grave of Met. Filaret at Jordanville. and St Sebastian in Jacksonville. Mount Athos is probably the most important pilgrimage site, but it's accessible only to adult males. In most Orthodox countries, people have a wide selection of local monasteries that they can visit for special occasions. In Cluj-Napoca, for instance, I can travel an hour northeast to Nicula Monastery which has a wonderworking icon of the Theotokos with Child, or an hour south to Poşaga Monastery which has a wonderworking spring. Those are just two, but there are many dozens of monasteries in Romania alone that have some interest. I was thinking the most important pilgrimage a Christian could take would be to the Holy Land. It used to be that a Christian who visited the Holy Land (more specifically Jerusalem) was given the honorific title of "Hadji", (Χατζη in Greek, الحجّي in Arabic) meaning "Pilgrim". If you can't make the pilgrimage to either Mt. Athos or Jerusalem, then any Eastern Orthodox monastery will be beneficial to your nous. Does anyone actually find religious peace in Jerusalem? I was too busy avoiding the touts and souvenir sellers and being pushed aside by big tour groups to actually gather my thoughts in prayer. I would love to be in Jerusalem for Pascha! I had the fortune of having my passport stolen in Jerusalem. The monks put me up. They didn't tell me, though, that they put my cot on Calvary, behind the altar. Early morning and midafternoon are the tourist hours. But otherwise, it can be peaceful. DL is at night, at Vigil. You can wander around the Church and be alone with your thoughts. I like the Protestant Gordon's Calvary because, a) it gives you an idea of what the real tomb was like in the 1st century and b) its a quite oasis in midday. I wasn't too happy with Sinai either. The gatekeepers (local Muslim villagers without a clue on organized world Orthodoxy) wouldn't even let me inside to attend Vespers because upon asking for my passport and seeing I'm a US citizen, they said "Americans aren't Orthodox. This place is only for Orthodox". Eventually I had to run past the gatekeepers' office really fast while they were distracted by something else. But when I walked out after the end of the service, they started yelling at me. The monks were visible only during the service, and then completely disappeared afterwards, with not even a glimpse in my direction. I was rather shocked, as at most monasteries I've been to all over the world the monks try really hard to offer spiritual guidance to all visitors. At Saint Katherine's, however, it seems they've handed the place over to the local Bedouins to run as a tourist attraction and then retreated away from the public. I unfortunately have never been, but I know that the monks have had a problem trying to get their own solitude in the place. There was talk by the Egyptian government, should the monks abandon the place (there was talk), to hire actors as monks. -Joy of All Who Sorrow Cathedral in San Francisco. Built by St. John of Shanghai and San Francisco, and home to his relics. -St. Nicholas Cathedral in New York (Moscow Patriarchate). -St. Tikhon's Monastery in South Canaan, PA. Home to a seminary, monastery and the relics of St. Alexis of Wilkes-Barre, as well as other saints. -St. Nicholas Russian Orthodox Cathedral in Seattle (ROCOR) where St. John of Shanghai and San Francisco reposed. St. Paraskevi Greek Orthodox Shrine Church in Greenlawn, NY: There is a grotto-shrine there, dedicated to St. Paraskevi, with a miracle-working spring of holy water. Many people have been healed of physical infirmities, especially relating to eyes (for which St. Paraskevi is known). St. Paul Greek Orthodox Cathedral in Hempstead, NY: In addition to amazing gold mosaics, they have a special shrine that contains a Myrrh-Streaming Icon of the Theotokos. St. Nektarios Greek Orthodox Church in Charlotte, NC: They are blessed with the Holy Relics of St. Nektarios the Wonderworker, for whom they have a shrine. The Church building itself is also an awe-inspiring structure. Holy Cross Greek Orthodox School of Theology: In addition to the grave of Bishop Gerasimos, an elder to many, there is a relic of the Holy Cross itself, as well as those of several martyrs and saints, including my personal favorite: Saint Panagis (Paisios) of Kefalonia, whose relics are as fragrant as those of St. Gregory Palamas. Many, many, many monasteries, most of which have Holy Relics. Some that haven't yet been mentioned: St. Anthony's in Arizona; St John Chrysostom in Wisconsin; Holy Dormition in Michigan, etc. The tomb of St Raphael of Brooklyn is located at the Antiochian Village in Ligoner Pa. When it comes to Jerusalem and Sinai, I would be iffy about going since both are seemed to be infested with tourists who probably don't really care about the Holy Places anyway. I would rather go to Athos. I have been to the seminary twice, once on a visit and the second time for their Crossroad program. I remember venerating St. Panagis' relics and was amazed by the fragrance that came from them. They also have relics of St. Arsenios the Cappadocian, Sts. Raphael, Nicholas, and Irene the martyrs, and the one that blew me away when I saw it, St. Andrew the Apostle who is my patron. It's such a great experience to venerate the relics of your Patron Saints. Venerating the relic from the true Cross was truly amazing. Since I live in Michigan, I have been to Holy Dormition which is a beautiful monastery. I've only been there once though but I plan on going for their feast day coming up. 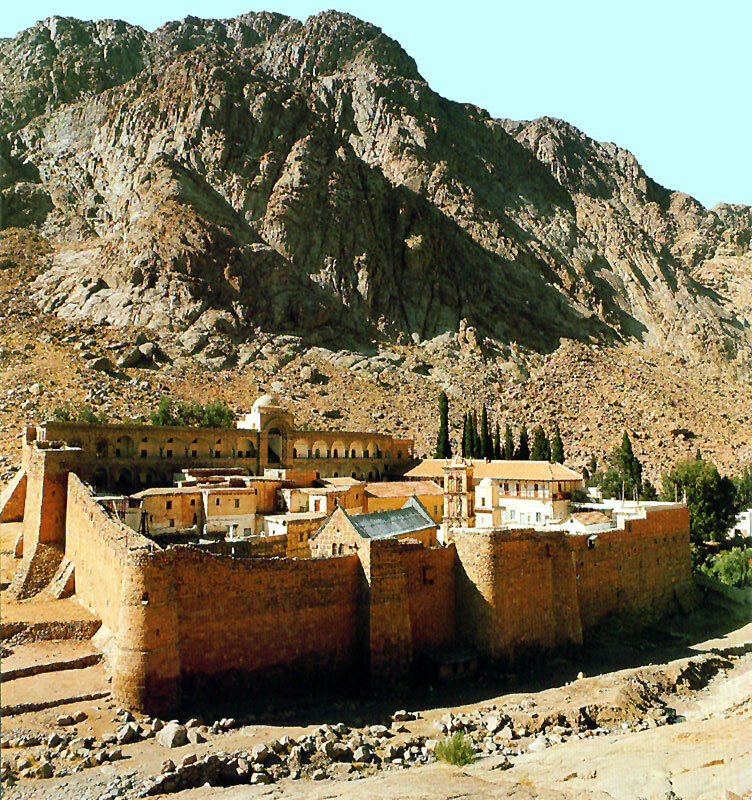 I have been told to go to St. Anthony's monastery by a few people and I hope one day to go there. I have been to the Holy Transfiguration Monastery in Chicago which is one of the Ephraimite monasteries and it is absolutely beautiful there and it is very peaceful.